The 65" Mondopad Display from InFocus blends video calling, white boarding, and more into one touchscreen PC for face-to-face collaboration with people in any location. You can bridge communication gaps, strengthen teams, captures & share information, train more effectively, and save time and money. It offers collaboration tools to meet the needs of business and enterprise. 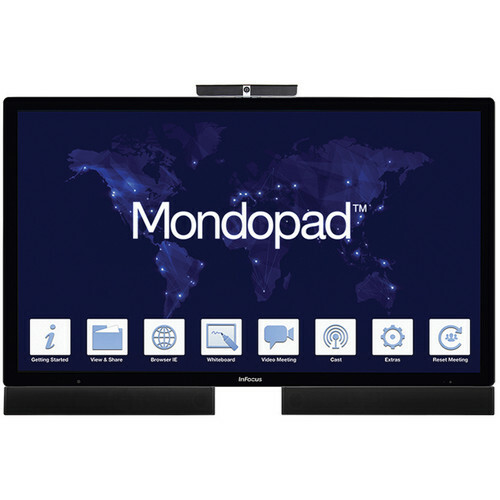 Mondopad features 1080p HD resolution, and powerful processor for applications and information security. The video connect feature instantly helps you visually collaborate on the same content and do better work in less time. You can brainstorm, capture, and share your ideas on an interactive whiteboard without borders or barriers with the interactive whiteboard. It allows you to make quick and easy notes on anything you're presenting and then save the changes. You can securely connect and share content with Mondopad from PCs, Macs, tablets, or smartphones.